The village of Little Barrington is somewhere you discover by happy accident. It is a small, peaceful village off the beaten track with a timeless charm. It is best known as the home of the Strong family who were master masons and suppliers of limestone for some of the finest houses in the Cotswolds. It was Thomas Strong , under the direction of Christopher Wren, who laid the foundation stone at St. Pauls Cathedral in London. 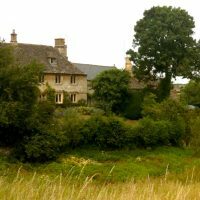 The honey coloured Cotswold stone that was used come from a large natural depression in the centre of the village where a natural spring wells from the limestone creating a small stream that feeds the River Windrush. The village cottages form a large oval around the rim of the depression broken only by the road and the stream running through down to the popular riverside pub – The Fox Inn. This beautiful setting inspires us to believe in ourselves and to follow our own personal dreams, whatever they might be, for with enough vision and perseverance anything is possible.